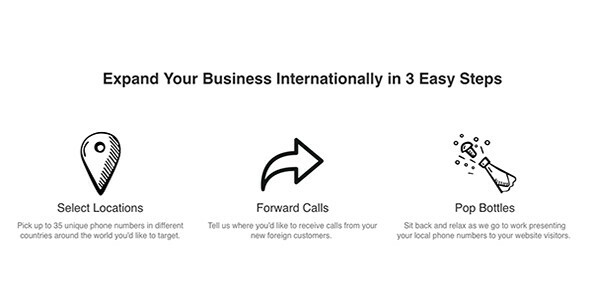 Free calls for international customers and local numbers around the world are enticing for a growing business. It’s a solid offering that makes it easy to appear local to virtually any customer, anywhere in the world. The value for the money you spend on a service like ZenPhone isn’t always easy to calculate. Each of the plans is relatively expensive if you were to compare it some other SaaS (software as a service) business models, and beyond what you might typically spend on other similar VoIP services. But ZenPhone isn’t really a traditional VoIP provider. The value for money really boils down to the type of business you run, customer engagement via phone, and the long term value of your customers. If you do a great deal of business in other regions where having a local number can be a benefit, especially with big ticket items or high value orders, then the service (even at the $799/mo price for the Premium plan) would pay for itself. For a smaller startup that doesn’t do a lot of business over the phone in other regions, that kind of premium tier plan might be cost prohibitive. There’s very little in the way of scalability with ZenPhone. Since you’re not dealing with a traditional VoIP service, there aren’t really any premium or add-on items. The three service plans provide a gradual increase in the number of phone numbers and minutes included, while the cost per minute on overages (minutes beyond your plan allotment) decreases. If a growing business started with the Basic plan at $99/month and found that international or regional business dictated a need for more minutes, the only option is to jump to the next plan or pay overages. 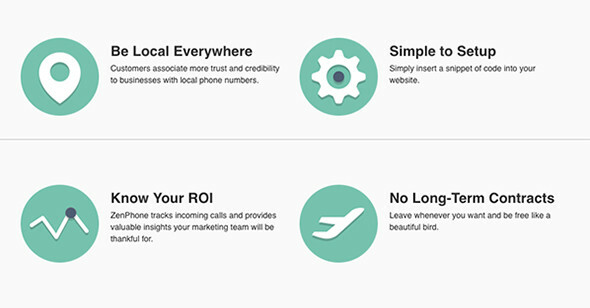 The setup for appearing locally to your customers anywhere in the world is surprisingly easy. The service is designed to turn the number on your website into a number that is local to your customers. When you create an account there’s just a few steps to run through. This includes selecting the locations (choosing up to 35 numbers in different countries around the world), choosing where the calls will forward to (this is your current number), and then inserting a snippet of code on your website. The code will read the location of your website visitor and display the appropriate local number to them. It’s relatively easy to setup if you’re tech savvy. If you don’t know your way around website code at all and don’t feel comfortable there, then you’ll need to get someone to tackle that part of the setup for you. While coding website content is a simple task for many, it would be nice if ZenPhone offered some kind of additional service to handle the snippet placement. Another good idea that would make setup easier for business owners would be a plugin for sites that automatically inserts the necessary snippet of code. There’s not much to offer in the way of customer service. The company does provide links to its social accounts, including Facebook. Its Facebook response time in messenger does say the team typically replies within minutes. When the team was asked a question via Facebook after hours, a response came within about 15 minutes. You’ll also be able to reach ZenPhone customer service by email and phone. There’s no listed hours for technical/customer support. When calling the listed 877 number on the site after normal business hours, “Adrian” answered the phone and stated that normal support hours are Monday through Friday from 9am to 5pm. After hours, calls forward to his phone. The site doesn’t currently offer any kind of public facing FAQ or tutorial section to assist with support, such as snippet installation. There’s also no kind of public facing ticket system or knowledgebase. As a web-based SaaS product, your ZenPhone account can be accessed from anywhere you have an internet connection. That’s handy if you need to make adjustments to contact numbers in the middle of a marketing campaign and you’re in a hotel or on a trade show floor. The same mobility gets you access to the dashboard where you can review analytics on your numbers from wherever you are. It’s a good way to keep tabs on your campaigns while in the field. An app might be a beneficial to some customers, and it’s unfortunate to see there’s only browser access. If a business is actually managing 30+ phone numbers for a larger account, a mobile app would make it much easier to manage those numbers and campaigns. ​ZenPhone provides a solid service that can help growing businesses who want to expand into distant markets. The cost is relatively steep, so it may not be ideal for smaller startups with limited budgets. You’ve got to consider the value of the region though; a service like ZenPhone is capable of giving the impression of a local presence which can create a big uptick in sales. If the return is there, then it could be a smart investment even for a startup. Now the company just needs to flesh out their content and customer service to provide some additional value to their customer base.